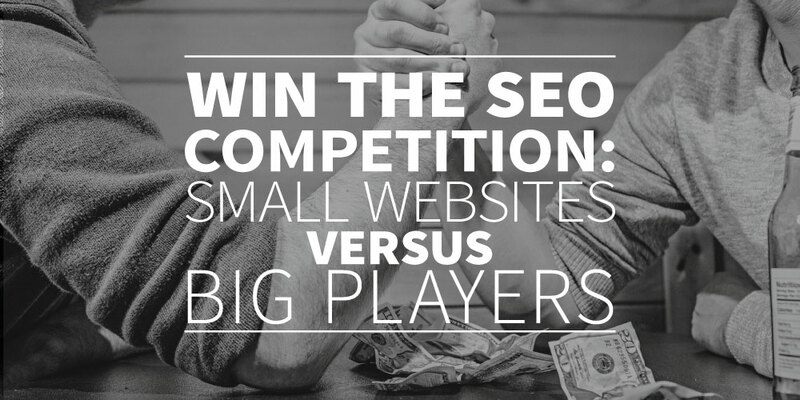 The biggest players win the SEO competition? As a small website you probably don’t have a big domain authority like bigger news websites or huge companies have. This means that small websites have way less to impress the search engines than bigger ones which, according to the most online courses, leads to a lower Google ranking. Big websites probably also have more incoming qualitative and diverse links, which means they also score big time on this Google ranking factor. This is something you probably can’t compete against as a small website, even if one of your articles gets a lot of traffic and links. And finally, the first thing most website owners think about, big websites have more money to spend. This is one of the many reasons why they should be able to ‘buy’ a high organic ranking. Now it’s possible you think; so this means I will always lose right? This may not be true! First of all, you can’t buy your organic Google rankings. Although money could help you to spend more time on optimizing your content, most of the times companies spend more time on other particulars than search engine optimisation. Also, as a small website you’re moveable. You can use your own creativity to decide directly whether you want to go with one flow or another. This could have a very positive influence on your SEO, because this way you can adopt the new developments in your field directly in your own online strategy. Also, you can focus on working towards the same goal with a small team. You can communicate directly about the completion of your blog/website. This could mean that your website or blog is more personal and helps you to target a specific target audience in a specific niche. And this focus is the basic for a high authenticity rate. Google tries to focus on the individual more and more and that’s exactly why ranking factors like focus, authenticity and specific content get so important. These are the factors you can compete with against the big players, as long as you focus on your target audience and how to reach them. Stop looking at the things you don’t have and focus on what you do have. That’s how you win the SEO competition from the big players! Want to know how to optimize your blog for your target audience and the search engine? Learn step by step by following our business blog series! Want to know more about this specific subject? Look at the Whiteboard Friday edition of MOZ!